Walking southward into Virginia, having departed the state that once belonged to it, I follow Highway 340 as it curves away from the Blue Ridge, compelling me to bid farewell to the mountains, cast now in the haze by which they are known. Here, in Clarke County, the road declares itself early and often, the Lord Fairfax Highway with horse farms, grand and humble alike, lining the road. Much of the topography, however, remains the same as in Jefferson County, granting a measure of geographical understanding to the district’s reluctance to align – the bitter legacy of a distant conflict – with West Virginia. Clark County’s economic and cultural concerns resemble those of the Virginia Valley region, sharing little with the mountainous Alleghany counties to the west. So it is that the identities of the places we inhabit and our own identities are shaped only partially by us, forged at intervals by forces outside, until the idea by which a place or we are known appears to others and ourselves, glimpsed unwillingly in life’s invisible mirror, as things we never intended them to be. Why my ancestors passed this way in the direction of the Smoky Mountains at the end of the eighteenth century remains a mystery that I may never understand, the clouds that veil the stars pressed close, unwilling to abate. Perhaps it was something akin to the dominant reason for their earlier journey from Pennsylvania to Maryland, namely affordable land and greater cultural tolerance or isolation. Or it could have been something completely unlooked for, something averse to historical circumstance, a reason altogether unlikely. Dwelling on this question, I realize that my travel based supposition, my vague feeling that following their route today might potentially provide answers or insight into their reasons for going, is perhaps the most ridiculous aspect of the entire undertaking, for it hinges altogether on the indistinct and evasive phenomenon of human experience. Whereas history may hold close her secrets from scholars and scribes, experience gladly doles out his brutal knowledge, however grudgingly, to those who, however foolishly, seek him out. History and experience are estranged lovers, the latter the event and the former the teller. Both are mysterious and perhaps ultimately unknowable, but that is precisely what makes them so seductive, both to each other and to us. The Spartan general lies dying on a field of battle 2400 years ago, perhaps wondering who will tell his story and recall his glory or dishonor, while the fragmentary data left in his wake fascinates the young historian, centuries later, hunched at a desk, in search of lost time, trying to make sense of, or even imagine, a place and worldview so far removed from hers that it might be considered alien. As the French poet Paul Valéry warned, "History is the most dangerous concoction the chemistry of the mind has produced. Its properties are well known. It sets people dreaming, intoxicates them, engenders false memories, exaggerates their reflexes, keeps old wounds open, torments their leisure, inspires them with megalomania or persecution complex, and makes nations bitter, proud, insufferable, and vain. History can justify anything you like. It teaches nothing, for it contains and gives examples of everything." Hardly an endorsement of the discipline. Yet, for all this, for all history’s faulty detours and dead ends, agendas and distortions, illusions and compulsions, historians have ever echoed the Roman historian Livy in ultimately deeming "antiquity a rewarding study." Passing one of the smaller rural homesteads along the road, I hear an abrupt bark from the shade of a large oak, followed by the swift advance of a large, black and tan dog. It barks as it lopes, tail up, bearing down upon me with bounds and growls. Rather than running, I loose the straps of my backpack and pull it around before me, holding it, elbows bent, as a shield, however ineffectual it might prove to be. When the canine, a well-fed doberman, gets within a few paces, he stops and dances from side to side, an inimical jig without music, save the barks he continues to hurl at me from deep within his throat. I gradually continue to advance down the road, backing, talking softly to the dog, remaining as still as possible, while trying to work my hand into the top end of my pack. After a few seconds of digging, I find the zipper to the tent pack and am able to pull free one of the folded fiberglass tent poles, hard to break and, when wielded, capable of inflicting intense pain on the sensitive end of a dog’s nose. The doberman follows but seems content to merely dance and bark. Watching it, I remind myself that this is no feral, rabid thing, but a fat domestic with a leather collar, dangerous to be sure but a creature that someone surely feeds and dotes upon, probably used to chasing the rare cyclist or wanderer who appears along his portion of the highway. Perhaps sixty feet down the road from the place where our confrontation began, the dog slows as I continue to fall back and then stops altogether, though its eyes remain fixed on me, its barks becoming intermittent. I retreat a few more feet and then turn and continue, the tent pole slipped back into the pack, the pack reunited with the sweat on my back, torso and shoulder straps reluctantly tightened. A few paces later, I glance behind me to see my potential assailant turned away from me, watering a sign post, leg cocked. He completes his marking, kicks up some loose gravel with his hind legs, and trots back down the roadside toward his shady tree, tail high with pride, identity intact, victor of the conflict, lord of his territory once more. On this day, Berryville is a quiet, peaceful town. Sitting in the cool corner of a shaded parking lot, hiding from my loyal fellow traveler, that persistent late summer sun, and drinking from a cold twenty-ounce can of beer, I see the area as the kind of place where folks are forced to make their own fun but are probably altogether happy and content to have things that way. Yet, as with many other places, this was not its nature more than a couple of centuries ago, the parochial visage of the mature present grown drowsy and somber in the wake of youth’s primal howl. Originally laid out in 1798 as Battletown, the village would alter its name later in tribute to its swashbuckling crossroads innkeeper and gamesmaster of the mid-eighteenth century, Benjamin Berry, who had constructed on his tavern’s front lawn, not far from where I am sitting, both a bear pit and a fighting ring, in which he was fond of pitting men or animals against each other in the hopes of drawing a bloodthirsty crowd, which he calculated, accurately it seems, would soon seek refreshment at his inn. Set along this well-traveled road, the place was ideally situated to attract fresh combatant and naive victim alike. Among the more storied fighters to pass through Berry’s ring was a young Daniel Morgan, then a hard-drinking wagoneer, who bested local champion Bully Davis in a punishing, bar-wrecking melee of more than an hour’s duration, which would lead to a rematch several months later that quickly dissolved into a free-for-all involving the entourages and friends of both Morgan and Davis, as well as the more than one hundred spectators who had come to witness the contest. Eventually Morgan’s contingent was victorious and the festive rowdies, stoked by blood and thirst, rushed Berry’s tavern en masse, much to the innkeeper’s delight. Departing the placid Berryville of the now, falling in with the sun once more, I am reminded of how ours is an ongoing savage history – in spite of the entitled sense of progress for which we congratulate ourselves – one we continue to exact upon each other as well as the creatures of the world we live in. The latter transgression has always seemed to me the more heinous since the animals who suffer at our hands cannot understand the material, abstract, or perverse human motivations that orchestrate their agonies. I think of the doberman who had pursued me, wondering if he had been encouraged or trained to go after every foreign thing that approached his owner’s domain. Then my image of him, dancing back and forth, nape hair raised – nature made over again by dream – dissolves into that of another such dog encountered years before, beneath a roof of corrugated tin in a nineteenth-century red brick warehouse converted into a dirty, hot gym, the concrete floor covered in dust and vague stains, the old steel equipment, nearly all of it, wearing a thin coat of orange rust. This grimy place of low grunts and sweaty bodies was owned by a semi-professional football player who also worked as a bouncer and dabbled in drug-dealing and dog-fighting. He was, however, for all these things, not a completely terrible fellow, inquiring after your health and freely offering his mostly hard-earned knowledge of the human body. Following him about the dark, ill-lit building – clammy in winter, ovenlike in the warmer months – was a massive three-legged doberman, his absent hind appendage mangled and amputated in the wake of some ill-fated distant contest. Yet, despite the needless cruelty to which he had been subjected by his owner, the dog remained loyal to him, ever at his side, a bane to any who might threaten him and altogether terrifying to many of the unoffending weightlifters. On one particularly hot afternoon, not unlike the one I find myself walking in now, as I lay on a rusty bench, pressing weight from my chest, I felt a sudden heavy pressure on my right thigh. Returning the weight bar to the steel frame above my head, I half-rose to find the three-legged doberman resting its head on my upper leg, its brown eyes fixed on my own in that strange imploring glance of companionship peculiar to dogs. Sitting up, I patted the dog’s head and rubbed his ears until he wandered away, probably in search of his master. The Catholic thinker Saint Thomas Aquinas believed that animals have no souls. One need know very little about them or theology to be certain that Aquinas was dead wrong; yet for all our science, our understanding of dogs and other animals remains so limited as to render our knowing indistinct – the knowledge of the other blurred by our preoccupation with ourselves – our focus fixed closely on our side of the relationship, our own perceptions – and molded by the limited collective assumptions of the time in which we live. Of course, arrogant hypotheses and the uninformed conclusions that inevitably follow them are not restricted to our relationships with animals or our own time. While traveling with a survey team in the area of Frederick County, the district into which I soon will be passing, in the spring of 1747, a sixteen-year-old George Washington noted that the inhabitants "seem to be as Ignorant a Set of People as the Indians. They would never speak English but when spoken to they speak all Dutch." Preoccupied with the importance of his English-speaking survey party, this precocious teen insists that the German settlers he encounters naturally should resort to his native tongue, attributing their reluctance to an inherent Indian-like ignorance and declining to entertain the possibility that they may have been speaking their own language out of preference, perhaps even in order to talk undetected about Washington and his companions. Washington also neglected to perceive his ignorance of the language as a personal failing, a symptom of his own incomplete knowledge, but then he was, after all, only a boy; and, reminding myself of this, I recall, all too clearly, the thick-headed prejudices of my own teenage years – that dynamic self-obsessed period in which we wish irrationally for other things, both possessions and circumstances, and believe we are privy to all answers, while the world about us responds too slowly. It is a phase of development that, unfortunately, fewer and fewer people of our own time appear willing or able to outgrow. Approaching Winchester, the town to which Daniel Morgan retired when his days of brawling and soldiering were done, I perceive against the western horizon Little North Mountain and Great North Mountain, eastern outcroppings of the Alleghanies, the great chain of peaks stretching northward into Pennsylvania and on toward the Catskills. Having longed for mountains since departing the Blue Ridge, I am struck by an indistinct reassuring comfort that accompanies their appearance. John Esten Cooke, born in Winchester in the first half of the nineteenth century and destined to witness the monumental carnage of that century’s, our nation’s, most tragic conflict, serving in the Confederate army, felt a comparable solace at the prospect of these hills: "I know not how it is with others but to me all sorrows and heart-sinkings come with far less poignancy amid the fair, calm, silent mountains." Cooke, perhaps possessed of some vague inkling of what bloody events lay ahead for his home and himself, also associated mountains with "the great mist-shrouded future," the nature of time as yet unfolded, obscured by the mist that hangs from the hills, resting softly on treetops. Greeting the Alleghanies and thinking of Cooke, I wonder what they may hold for me. Upon crossing Opequon Creek into Frederick County, I begin a long, gradual ascent toward Winchester. Whereas the Alleghanies had introduced themselves remotely, above the horizon in the distance, Interstate 81, an immense road that will shadow me throughout much of my journey but that I hope to avoid as much as possible, appears for the first time below me, beneath a highway bridge I am crossing. The massive travel artery that replaced Route 11, which in turn had developed out of the wagon road grown out of Athowominee, 81 is a swarm of gaseous wind, speed, and thunder, trucks and cars interweaving, packed close, hurtling toward ends and destinations I cannot guess. Though possessed of a generous median and wide roadside shoulders, the large thoroughfare is banned to foot travelers; probably for their own good, but there are places to the south – if I get that far – where it merges with, or rather absorbs, Route 11, places where I’ll find myself reluctantly tracing it, or, without much regret, passing along an alternate route. The strip malls and businesses that appear with the interstate feel claustrophobic after so much walking in the open, amid agricultural land and the occasional residence. Yet, these are appropriate enough sights to greet me as I enter this place founded and perpetuated on commerce. In 1789 André Michaux described Winchester as "a little town whose Trading with the Settlements of Kentucky is done by land. The merchandise comes from Philadelphia, Alexandria and particularly from Baltimore." A cog in the machinations of westward colonial distribution, Winchester was a place to buy, sell, and haggle – to empty the wagon or resupply, depending on your needs. One notable local merchant whose trade had far-reaching influence was the German gunsmith Adam Haymaker. Following the European German tradition, early gunsmiths in North America had crafted high-caliber flintlock rifles for the purpose of felling animals as large as a mature black bear. However, soon realizing that mobility, and therefore considerations of convenience and weight, were of the essence given the circumstances of travel, guncraftsmen like Haymaker began engineering smaller barrels and stocks, maple and black walnut being the materials of choice for the latter. By the second half of the eighteenth century the typical gun was a .36-caliber rifle, usually fixed with a bayonet for the purposes of possible Indian engagements or finishing a kill. The weapon was lighter, more accurate, and required less powder. Beyond colonial Winchester, we need look no further than the multi-million dollar military-industrial complex of today to see that weapons and commerce have always gone hand in hand in the United States, and are still going strong, the path to economic development cleared through military might, though the terminology changes slightly, the bluntness of Manifest Destiny having given way to fuzzy linguistic blankets such as Nation Building. It is a small semantic irony too that a century or so following the improvements Haymaker and others brought to the North American rifle, a gun called the Winchester, developed by a New Yorker named Oliver Winchester, would come to be lionized as "the gun that won the West," its repeating rounds introducing a new deadly quality into firearms combat. Like other such technological innovations of war, the Winchester was an implement of dehumanization as well as progress, both in terms of the way it impersonally vanquished those who opposed its wielders and the unconscious toll it could exact on those very wielders, as well as the people involved in its creation. Having come to believe her family haunted by the restless ghosts of the thousands cut down by her husband’s rifle, Oliver Winchester’s wife Sarah would flee, shortly after his death, from New Haven, Connecticut, to San Jose, California, where she would use her husband’s lucrative industry profits to construct indefinitely an elaborate, one hundred and sixty room mansion, designed haphazardly with the help of a spiritual medium in order to accommodate the angry ghosts seeking vengeance upon her. As the family necromancer explained to Sarah, "You can never stop building the house. If you continue building, you will live. Stop and you will die." A Rasputinesque hoax perhaps, yet I wonder if modern psychology could have offered Sarah any greater measure of peace, the lives extinguished by her husband’s invention having come to be the sole fixation of her own. Lost amid these musings, I discover that I myself am lost, literally, in Winchester, wandering in a residential neighborhood, evidently having missed the signs that would navigate me through town and onto Route 11, the street I am walking along devoid of a number, bearing an unfamiliar name. Though curious at my misstep and apparent inattention, I am not especially bothered, having found that most people in towns and small cities – at least in this part of North America – usually are willing, if not happy, to give directions. As John Steinbeck noticed decades earlier, "The best way to attract attention, help, and conversation is to be lost. A man who seeing his mother starving to death on a path kicks her in the stomach to clear the way, will cheerfully devote several hours of his time giving wrong directions to a total stranger who claims to be lost." Though I have never attempted Steinbeck’s strategy of merely purporting to be lost, his point about direction-givers appears mostly true. Asking directions at the next convenience store, I am not only told where to go but actually taken there by a carload of friendly female students from Shenandoah University, a local college somewhere nearby. Sitting in the backseat of the car, trying to soak up the air conditioning, my voice sounds to me both tight and sluggish as I converse. Only later, after I am dropped off, do I realize that these are the first people I have talked to at any great length in days. Since the outset of my journey, I have heard fragments of numerous voices, but used my own very little, though this silence is partially by design. Many scribbling wanderers, especially the journalistic variety, go out of their way to talk to as many people as they can, seeking out, sometimes obtrusively, county officials and influential community people on the one hand, and those they believe to be the local downtroddens and deviants on the other, ostensibly hoping to arrive at a kind of voyeuristic sociological montage of the community at hand. Yet the people on the other end of these questions – rich and poor, educated or not – usually divine exactly why they are being questioned, often because the traveling interlocutor readily and proudly volunteers his purpose and aim. As a result, the people at hand frequently offer only embroidered images of their lives and places – appropriately fabricated responses to forced, synthetic questions. I wanted to avoid a lot of that if possible. I knew I was passing through the environments and spaces of others – their lives and places – and to actively seek some kind of connection seemed artificial and presumptuous to me. My attitude was that it would come to me or it wouldn’t, and that whatever did arrive of its own accord would be far more interesting and authentic than anything I might actively seek out. The philosopher Buber went fundamentally further, asserting that "the depths of the question about man’s being are revealed only to the man who has become solitary, the way to the answer lies through the man who overcomes his solitude without forfeiting its questioning power." Though the twenty-first century human of the United States finds himself wholly interconnected on the literal, technological level, his fundamental personal state remains significantly cloistered by the very economic and industrial forces that connect him, in the abstract, to the rest of the world. Remoteness then is not something most of us have to work at very hard in order to achieve. As the poet Rilke maintained, aloneness "is at bottom not something that one can take or leave. We are solitary." So I feel myself passing more like a ghost, transparent as the wind, a walking stranger in the night or the day, there and then gone among places and people. It encourages me too that the first European to enter the Shenandoah Valley, John Lederer, traveled in much the same way, treating with the Indians only when invited to do so and remaining ever silent and courteous at the strange things he witnessed, most of which he did not understand and could not hope to explain or even portray – foreigner to a land that did not know him, one of great mysteries. The poet W.H. Auden said of the wanderer in his poem of the same name, "Ever that man goes through place-keepers, through forest trees, a stranger to strangers." The kind Shenandoah students have dropped me off near a local high school on Route 11, a road known also as the Lee Highway and the 11th Infantry Regiment Highway, the history of human conflict asserting itself again in these memorial dedications to distinguished American soldiers of the past. A site of strategic geographical importance in eighteenth century North America, Winchester was destined to accommodate its share of military personalities. At the beginning of the French-Indian War, long before the town had become a great trading center, Colonel George Washington, having negotiated his teenage years and passed into early manhood, came to the area with orders to raise and train a militia, which in time would effectively transform the village into a kind of garrison. However, even as the newly-constructed Fort Loudoun (named by a grateful Colonel Washington for the British general who armed the fort and afforded him the legal authority to hang militiamen for disciplinary infractions) loomed over the town with its two-hundred-and-forty-foot walls set atop a hill to the north on an ancient burial ground, the basic lack of discipline among young Washington’s charges and the imperative need for readiness forced him to resort to draconian methods in literally "whipping" his men into shape. Profanity, for instance, brought twenty-five lashes from the cat-o’-nine-tails, feigning illness fifty, and drunkenness a hundred. Although whipping post justice was not new to Winchester – in the mid-1740s, for example, a girl received twenty-five lashes for bearing an illegitimate child – the offense of drunkenness, despite the harsh penalty, remained particularly prevalent and difficult to stop since locals had developed as a prosperous side-racket the selling of gin and liquor to Washington’s men. Late in the summer of 1756 the young colonel threatened the townspeople not to allow "the Soldiers to be drunk in their Houses, or sell them any liquor, without an order from a commissioned officer; or else they may depend Colonel Washington will prosecute them." For all this warning and intimidation, threats and whippings in some cases were not enough. In one particular instance, two men were hung from a newly-constructed gallows before the town, shortly after the arrival of a group of new militia recruits – a spectacle Washington felt would "be good warning for them." 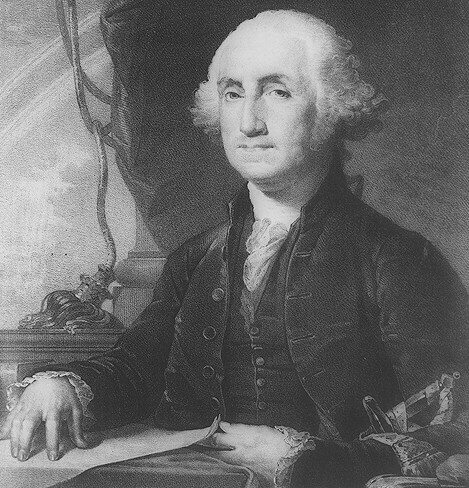 It is odd to think of young Washington, for whom so much destiny and distinction still lay in wait, chiding and bullying his men and the townspeople, frustrated at their stubbornness, their lack of fear in the face of verbal and physical intimidation, their indifferent stoicism and strong will when punishment was visited upon them – though it would be these same traits that eventually would transform many of them into fine soldiers and, if they managed to live into the 1780s, archetypal Americans. Odd too that on the site of an old Shawnee camping ground Washington was training a force to help bring about that tribe’s destruction, history – even when rooted in a single place – steadily moving toward the next conflict, the next seizure and occupation: the traces of the conquered buried along with their culture, the conquerors having begun already the unconscious journey toward their own indefinite downfall, the vague legacy of the defeated, departed and approached again. I am glad to get out of Winchester, although the sprawl that emanates from its center makes it difficult to say exactly where it really ends. I do not really feel the Valley either until Winchester is left in my wake, the topography revealing itself again, less impeded and concealed by the deeds and constructions of humans. A long strand of low rich land stretching northeast and southwest, the Shenandoah Valley lies cradled between the Blue Ridge to the east and the western Allegheny Mountains, their name drawn from an Indian word meaning "Endless." Because the Shenandoah River flows north, general directional travel references are reversed here: heading south as I am is referred to as "going up the Valley." By the eighteenth century, few Indians inhabited the region, though they still passed through frequently on hunting and trading expeditions. When European settlers arrived, parts of the Valley already were open with meadows that could be converted easily enough into agricultural fields, their openness a result of those periodic Indian burnings, purposeful land-clearing forest fires, not unlike those employed by foresters today, set to facilitate crop growth and attract game. In the neighborhood of Winchester it is so thickly settled, and consequently so much cleared, that wood is now beginning to be thought valuable; the farmers are obliged frequently to send ten or fifteen miles even for their fence rails. It is only, however, in this particular neighborhood that the country is so much improved; in other places there are immense tracts of woodlands still remaining, and in general the hills are left uncleared. The wilderness transformed into plentiful fields, wheat became the dominant crop in the Valley during the second half of the eighteenth century and would remain so for more than a hundred years. There are fields of it even now, grown from verdant green nubs into swirling wind-blown oceans, golden with new grain. Both during the American Revolution and decades later, when Virginia seceded, it was the Valley that provided bread and forage for its armies and horses, though great fields of hemp were cultivated as well in the time of the former conflict, primary material in the making of rot-resistant rope and paper. The hills being thus left covered with trees is a circumstance which adds much to the beauty of the country, and intermixed with extensive fields clothed with the richest verdure, and watered by the numerous branches of the Shenandoah River, a variety of pleasing landscapes are presented to the eye in almost every part of the route from Bottetourt to the Patowmac, many of which are considerably heightened by the appearance of the Blue Mountains in the background. Though the Valley is much changed, there remain places where Weld’s visual description is as accurate now as it was over two centuries ago, much of the land still farmed, rolling – laying well, you might say – and most of the visible Blue Ridge clothed in dense forest, huge tracts of it owned and preserved by the federal government. Along the highway again, passing over Opequon Creek, a body of water I’d already encountered once, I am reminded of the well-known expression by the ancient philosopher Heraclitus: that one cannot step into the same river twice. Though bearing the same name, the Opequon beneath me is, for all practical purposes, a disparate body of water – fed by different streams, containing a variant water chemistry – from the one I had crossed to the north. So too both it and the whole Valley are vastly different entities within their respective identities from what they once were in the past – though each occupies the same geographical position and may appear in places similar. I remind myself of this condition from time to time: that this is merely, and can only be, despite the occasional temptation to imagine it otherwise, the Valley of my own era. More discernible and easier to keep in mind, since they are ever before and beneath me, are the changes to the trail I am following: this highway of asphalt, concrete, and rock that once was Athowominee, a muddy footpath, overgrown in places by weeds and grasses, only cob webs and sapling branches to greet the face of the infrequent traveler. In the wake of the French-Indian War what had been a modestly-traveled wilderness path for Indians and, increasingly, frontier settlers was widened and graveled in an effort to make wagon travel easier. Local counties generally shouldered the expense, though the funds they put forth generally came back to them or were surpassed as a result of increased travel and commerce along the route. In addition, it was local farmers who performed the labor in the winter months or during the slow time between planting and harvesting. Thus, much of the money expended went to local residents and, by extension, back into the county economy. Above the village of Stephens City, originally Stephensburg, I climb a plateau where I can see the Blue Ridge and Alleghanies off in the distance on either side of me, a perspective that affords a kind of context both for the Valley and my place in it. Unfortunately, the prospect also affords a clear view of 81, the large multi-wheel trucks, the size of toy models at this distance, dwarfing all other traffic. Though I dislike the appearance of the interstate, I am glad it is there for the purposes of my labors, the thought of all that traffic, all those massive trucks, crammed onto Route 11 not a very pleasant or practical one. Of course, long ago the route had accommodated a significant portion of the overall commerce in the North American colonies. Instead of long lines of trucks, the late-eighteenth century traveler would have encountered herds of livestock – cattle, goats, sheep, pigs – being led to market, either in the nearest town or perhaps even to the great livestock capitol of Philadelphia. Other essential merchandise – salt, sugar, medicine, tools, gunpowder, manufactured goods – was transported either by wagon or packhorse train. And then there would have been the locals, walking or riding to work or church, and the far-bound settlers, afoot or perhaps sitting amid their possessions in Conestoga wagons. Ironically, many local folk then felt the same way about Conestogas as modern travelers do regarding tractor trailers, the wagons’ heavy bodies and wheels creating deep ruts and mushy holes when the ground was wet and huge clouds of dust in the arid heat of late summer and early fall. Just as massive truck tires explode and litter the highway, so wrought iron nails would shake or jolt loose from the wagons, dropping to wait unseen in the dirt for an unsuspecting traveler – perhaps the next barefoot farm boy, sent to town for a few grams of salt or sugar, maybe, if he was lucky, a piece of hard candy for himself. Late afternoon, shadows long, grass already dampening, resting before I strike the tent, having received permission to camp at the edge of a pasture, I hear a cow bell in the distance, and, closing my eyes, try to imagine, as best I can, this time of day for those distant travelers who passed this way before me. Along the road, in the fields, amid the gentle dusk of a Valley summer, the packhorse and wagon teams unhitched and hobbled, the long day’s sweat and imprint of harness thoroughly scrubbed away from the horses’ flanks by the attentive human master for whom they constitute a livelihood. With bells placed about their necks, they wander deeper into twilight, grazing, until darkness fills the Valley and the drowsy traveler, laid out beside a fire or stretched on a straw mattress in or beneath his wagon, can no longer see them. Yet this does not trouble him as he gradually succumbs to slumber amid the damp grass and all his worldly goods, for across the field there drifts, lighter than air, a kind of lullaby of wind chimes: the soft tinkling of horse bells. However we modern individuals might choose to imagine it, traveling was no romantic matter for drovers and wagoneers, the livestock and goods they managed a necessary hindrance and burden ensuring their ability to set food before their families. Bent on speed and efficiency, they would have carried little else with them beyond their goods, the bare minimum – an essentialist mentality that still exists today for those who happen to travel long distances on foot or horseback. Next day, wandering here along the road, my wagon on my back – a forest green Lowe Alpine backpack of polyethylene foam, roughly a foot across and two feet in length – contains everything I deem necessary on a daily basis, though even an experienced hiker may discover over the course of his journey that he is carrying things he really does not require, in which case they are usually left behind, given away, or mailed home. Subtracting weight from a pack is a fundamental and persistent objective of all wanderers since it increases comfort and ease of movement while lessening the unrelenting strain upon the back and knees. Along this road, my own material existence is reduced to a two-pound tent, summer-rated light sleeping bag, foam pad, lightweight battery-powered headlamp, small flashlight, stove and one-liter fuel bottle with cook pot, Kabar knife, three twelve-ounce plastic water bottles, one-ounce bottles of disinfected rubbing soap and sunscreen, half-roll of toilet paper, small stainless steel bowl for both drinking and eating, dried fruit, meat, and garlic cloves (to deter insects) in ziplock bags, clay pipe and tobacco pouch (a nonessential vice), bandana to keep the sweat from my eyes, a white cotton shirt, one pair of shorts, underwear, one pair of liner socks and two pairs of wool socks, wool pullover, rain pants, poncho, moleskin one-ounce bottle of hydrogen peroxide, and a jackleg collection of road maps for Maryland, West Virginia, Virginia, and Tennessee, torn from their travel books and held together by a plastic, as opposed to metal, paper clip. Everything else on my body, worn and in use. Perhaps such lists can only appear mundane, mere corporeal distractions from greater abstract purposes. On the other hand, it may be closer to the truth that they, the visceral and the mental, are intertwined, perhaps even hopelessly tangled. Among all the world’s thinkers, probably it was the philosopher Spinoza who pursued most doggedly the confluent nature of mind and body as mutual determinants of human existence. In fact, as my journey unfolds, I find my bodily needs and mental musings increasingly overlapping and giving way to one another: the mind that hungers in the monotony of travel, the body that wonders in the midst of its fatigue. To be sure, there are times when I wish for additional equipment or information, as well as various other things, but these desires eventually give way to the more perspectived and abstract observation that I generally have with me, amid this twenty-five to thirty pounds of mass on my back, all I really need. Obscured, or rather drowned out, by conditioned cultural and corporeal concerns, this brand of thinking – a kind of applied minimalism – comes to twenty-first century Americans with great difficulty, ours being an unprecedented arcane culture of wealth and excessive ownership, the frivolous objects in our basements and the ever-appearing, labyrinthine roadside storage complexes hardly necessary to our existence. By and large, such gluttonous consumption would have been foreign to the local residents of over two centuries ago – homes small and spare, possessing for the most part, only what they made or grew – though there were notable exceptions. Leaving the area of Middletown, I pass the opulent limestone estate Belle Grove, built in 1797 for Major Isaac Hite (Heydt), a descendant of German immigrants from Alsace who attended the College of William and Mary and served in the American Revolution. In 1731, Isaac’s father, Hans Jost Heydt, had bought ten thousand acres of land in the Valley and led a party of German families down Athowominee from Pennsylvania, onto Maryland’s Monocacy Road and over into the Shenandoah. Though Jost did not own slaves, his son, years later – grown immensely wealthy through the gradual, efficient, and lucrative sale of his father’s real estate – eventually would come to have in his possession more than a hundred, a bizarre anomaly in the region. As Isaac Weld Jr. summarized in 1796, "On the eastern side of the ridge cotton grows extremely well; and in winter the snow scarce ever remains more than a day or two upon the ground. On the other side cotton never comes to perfection; the winters are severe, and the fields covered with snow for weeks together." Furthermore, with a few exceptions, the nights were too cold in the mountain and valley region of Virginia for cultivating the less hardy variety of tobacco grown at the time. This and other environmental variations between western and eastern Virginia, along with the inherent cultural differences among western settlers and the Anglican planters of the east, conspired to make the slave plantation an oddity and the African-descended population extraordinarily sparse, though it would grow steadily in the decades leading up to the Civil War. Frontier Germans in particular took pride in their independence and self-sufficiency, developing small farms that could be run efficiently by the family with occasional help from neighbors during episodes of construction, planting, and harvesting. These lifestyle differences from eastern Virginians eventually voiced themselves through legislation. With the aid of lawmakers like Jefferson, western Virginians – the more numerous Scotch-Irish, as well as the Germans – increasingly pushed for greater influence in government, ultimately disestablishing the Anglican Church and abolishing the laws of primogeniture and entail, which they generally viewed as decadent and unfair. The influence of the east, however, with all its benefits and evils, did penetrate certain portions of the Valley: on the rare large plantation like Hite’s and around Winchester, where nearly everything could be sold or traded, including the labor of slaves and indentured servants. Frontier Germans were especially unlikely to own or acquire slaves as a result of their religious convictions, economic frugality, and their own recent vivid experiences with thraldom. Coming to North America, families that had fled the Germanic states, including my own ancestors, would have endured a hellish six to eight week passage across the Atlantic from Hamburg or Bremen. Despite the terrible conditions they had lived under in the Palatinate, few were penniless when they departed their homes and the southwestern Germanic states were among the least feudalistic, meaning some individuals actually had owned their land. However, all but a few were quickly exploited out of whatever money or possessions they might have had on them. Frequently, they were purposely detained at ports while local merchants orchestrated a practiced racket of gradually sucking dry whatever money they had brought with them. Once onboard, their goods were often looted by the crew as their physical health began to diminish in an environment highly conducive to malnutrition and epidemics. As Gottlieb Mittelberger remarked, "During the passage there doth arise in the vessels an awful misery, stink, smoke, horror, vomiting, sea-sickness of all kinds, fever, purgings, headaches, sweats, constipations of the bowels, sores, scurvy, cancers, thrush and the like, which do wholly arise from the stale and strongly-salted food and meat, and from the exceeding badness and nastiness of the water, from which many do wretchedly decline and perish." Mittelberger, like many others, traveled on a cargo ship haphazardly altered for travelers through the construction of a makeshift deck built between the upper deck and the hold. Since it would be collapsed after disembarkment to make cargo room for the return voyage, the deck was loosely built, primitive, and uncomfortable. The ship’s hatches provided the sole ventilation and were clamped shut when the weather turned foul. Latrines were scarce and the middle deck was entirely open, affording little privacy for women, who sometimes found themselves molested by the ship’s crew. By the mid-eighteenth century, shipping tactics and conditions, particularly on vessels owned by an especially nefarious English company called Stedmans, had refined themselves nearly to the point of rivaling the Atlantic slave trade in overall cruelty and dehumanization. Between 1750 and 1755, two thousand passenger corpses were cast into the ocean. Onboard, travelers were expected to provide their own meals and, having little or no prior knowledge of sea travel, they usually misjudged their provisions; if their supplies gave out, they had to buy food from the captain, for which they were charged exorbitantly – a calculated measure to bury them deeper in debt. Those who brought with them chests full of dried meats and fruits, brandy, and medicine often were forced to leave them behind or store them on other ships, which again placed the traveler at the mercy of the ship’s commanding officer. If a passenger died during the passage, family members were charged the individual’s fee, a particularly tough blow if the sole survivors were women and children. If a child’s guardians both died, the minor would become the property of the captain who would then sell the child as a means of exacting payment for the parents’ fare. Plummeting into debt meant having your family become servants in the New World. The going price for a man was ten pounds for three years of servitude; some were bought for up to seven years, and children were owned until the age of twenty-one. In return for this specialized variety of slavery, the owner would pay off whatever debts the traveler owed the captain – the process was called the "redemptioner system." The eighteenth-century German immigrant arriving in Philadelphia harbor would have been allowed to disembark only if his sea passage was paid and he had no outstanding debts. Those who owed money waited to be sold off, the healthier going first and the sick and the weak sometimes dying onboard, too useless for purchase. Being bought by a master carried with it no guarantees of fair treatment or extended care. People could be swapped or sold if they did not fit the owner’s plans. As one period advertisement read, "For sale, the time of a German bound girl. She is a strong, fresh and healthy person, not more than twenty-five years old, came into the country last autumn and is sold for no fault, but because she does not suit the service she is in. She is acquainted with all kinds of farm work, would probably be good in a tavern. She has still five years to serve." As horrific as this process might sound to twenty-first century readers, the sum and utility of a human being set in the bargain value context of a newspaper’s classifieds section, we must do our best to keep it situated in the context of the time, during which such prospects did not seem completely unpleasant alternatives to the mauling periodic violence and ongoing deprivation of early eighteenth century life in the Palatinate or Bavaria. Furthermore, as with all slaveholders, there were good masters and bad ones, and the degree of youth, strength, and potential knowledge of a trade affected the manner in which people were treated, the adept learners and hard workers quickly becoming indispensable to their masters, the weak and the slow loathsome burdens. Difficult for the modern thinker to grasp, the system was devoid not only of civil rights, but of any rights at all; and though it is said to have been increasingly "humanized," the practice was not abolished altogether until the 1820s. Always departing – not unlike my ancestors, though my conditions remain decidedly more favorable – I feel myself nonetheless ever present in the place through which I am passing – the living domain that is the visceral continuum of the traveler, experienced and remembered. It is fanciful in any event and perhaps ultimately irresponsible to wish to disappear entirely, dissolve ourselves utterly, from the inevitable conflicts that afflict the human who lives among other humans – the cruelties we collectively visit upon animals, each other, and the world itself – as well as the more harmless manifestations and vestiges: abstract cultural clashes, the packed professional wrestling arenas and football stadiums – those grand American coliseums, the coarse weekend battletowns of our time. Outside forces propelling us into scenarios and identities we could never have imagined, ours remain lives that drift indefinitely so long as they are. And sorrowful is the soul swept on a strong current, rudderless, until at last it finds that stagnant pool, where still waters offer up the morbid image of what it truly is – this dying thing it never intended to be. Yet so long as there is intention there is hope, for intention is a window that opens upon the heart. Being can never be dead so long as we mean to become something. And we can do worse than mean well.